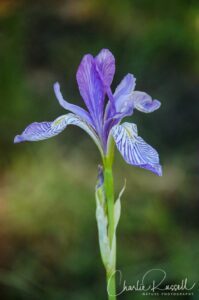 All of the photos that are found in my Wildflower Hikes and Charlie Russell Nature Photography websites are available for purchase or licensing. They are available in multiple formats, with multiple mounting options. Prices vary depending on the size, format, and your location (shipping and sales tax). The most popular way to purchase my photographs are as high quality photographic prints. 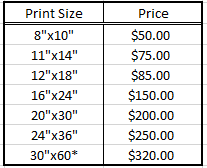 The prices listed below are for unmounted photographic prints using Kodak Endura Lustre paper, which has a fine grain pebble texture that provides a semi-gloss finish. Other options are listed below. Free ground shipping is included for addresses within the United States. Additional sizes are available, please let me know what you are interested in. Mounting will help prevent warping, and multiple options are available. I recommend 3/16″ Gatorfoam. Satisfaction is 100% guaranteed. If you are not satisfied with your print, please return it to me for a full refund. To order a print, please contact me with the image name, print size, paper type, mounting preference, and any special requests you may have. I will reply as soon as possible with a confirmation of the exact price. To specify an image name, when you are viewing a full-size image, note the “URL” or web address in your browsers. This will contain the image name. For example, for an image URL of https://ibrakeforwildflowers.com/wildflowers/#foobox-1/0/CrookedLakes-20180615-379.jpg you can just ask for the portion that I’m showing you in bold/italics here (or the entire URL if you wish). Your print will not include a watermark. These appear only in the online display versions for copy protection. I’m always happy to hear that you find joy or inspiration in my photography or that you find my writing interesting and useful. If you like one of my photographs or one of my posts and you want others to know about it via your website or blog; please post a text link back to the original photograph or article on my web site. Do not copy photographs or articles and place the copied material on your website without prior permission. Any use of my photography in a web site or other electronic form (as well as in printed form) is subject to copyright laws and may only be done with appropriate permission and a license. Please contact me for more information if you would like to license photographs for web/electronic placement or for any other use of my photography or writing. I license photographs for many purposes including installation in public/private/corporate spaces, hotels, restaurants, gift shop sales in national parks and monuments, magazines/journals, book covers, cards, web sites, brochures, and so forth. Contact me for more information or to send a proposal. Don’t hesitate to let us know if you have any trouble finding your subject in my image library; I may have the perfect match for your project in our offline files. I occasionally donate a limited cost-free license to use my photography to organizations that do “good work” in the public interest and whose causes I believe in. If you think that your request might be in line with my general policies, please contact me to discuss your proposal. One example would be the Yolo Basin Foundation. All photographs and articles on this website are © Copyright Charlie Russell – All Rights Reserved. No unauthorized use is permitted – and all use requires advance permission.